Chalet Cuckoo Clocks - Huge Selection + Free Shipping! 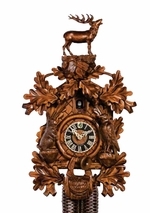 Developed at the end of the 1800s, the chalet cuckoo clock was a Swiss invention that was later adopted and adapted by German and Bavarian clockmakers. An amazing mix of horology and diorama, 1-day and 8-day chalet cuckoo clocks are often built to resemble the characteristic dwellings of the Swiss Alpine region. Chalet clocks feature dancing figurines, music boxes, the charming cuckoo bird, and other elements to tell a unique story every hour or half-hour.